Robocon is one of the first students of Robot School. He was made by Mr. Gantz, a teacher robot. He comes to the human world from different dimensional world for practice, and starts to freeload on the Kurihara Family. In the human world, Robocon is supposed to put "become friendly with humans", the theme given to him by his school, into practice. And Teacher Gantz is to grade Robocon every week and gives him a heart-shaped seal when he gets full marks. 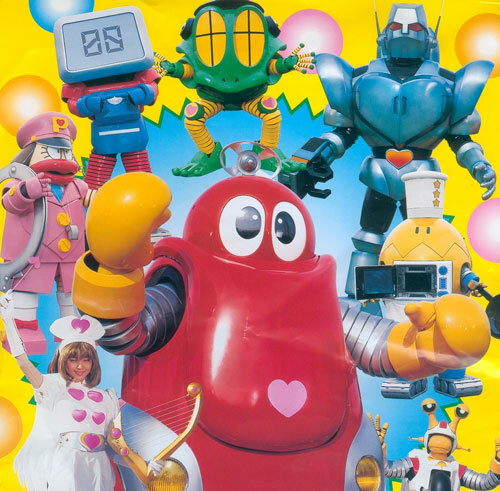 And with 10 seals, Robocon does his best not in order to obtain the seals but to earn the respect of a cute little girl Robina whom he likes very much. People of the Kurihara Family are troubled a great deal by Robocon because he not only breaks furniture in the house but also uses a lot of electricity as his fuel. In such surroundings, will softhearted Robocon really carry out his objective? © 1999 ISHIMORI PRO • TOEI COMPANY, LTD. ALL RIGHTS RESERVED. Licensed by Animation International Ltd.